As her peers at, Watkins Overton High School, submitted college applications to several in-state schools in Tennessee. Denisha Thomas had her eyes set on a school 6 hours and 2 states away. Yet, that was no surprise as the oldest of 3, Thomas has always found a way to mold her own path and to excel in her independence. BWIB, caught up with the University of Missouri graduate, to find out what motivates Thomas in her career; she spoke frankly on issues including the importance of her southern roots, how finances impacted her career choices, and how she is learning to balance the facts and opinions into an unbiased newscast. Q. How did you become interested in producing? As a child I watched the news, which is weird because most of my friends to this day still don’t watch the news even though I’m like that’s how I make my money…watch! One of the things about being a producer is you don’t do it to get credit whatsoever. You have to be secure in yourself enough to know you’re not going to get the recognition and that’s not why you’re doing the job. At the same time there’s not a lot of exposure to the fact that there are people of color behind the scenes; it’s not just the ones that you see on the screen, out in the field, or even sitting behind the anchor desk. There actually are [people of color] who are calling the shots. I want to expose and inspire other black women and young black girls in particular who are considering going into this industry, is for you to not only think the only role you can play is in front of the camera. Yes, you may be pretty yes you maybe be attractive…but if you love this industry but you don’t feel as comfortable going out into the field, being the face, or having to watch everything you do and say there are other alternatives in this industry where you can still get the same satisfaction of being a story-teller. Q. What peaked your interest in, The University of Missouri? My senior year I applied to various schools, a couple of in-state schools and a couple of out- of state schools. A friend suggested I apply to Mizzou (The University of Missouri). I knew about the state but not necessarily the school. Typically, as a Southerner we just don’t leave the South because we have a culture of our own that’s kind of hard to adjust to other cultures. So I applied [to] Mizzou, I visited the school and I fell in love. I fell in love with the Missouri method, which is hands- on experience and they introduced me to a new field called, Convergence Journalism. I was very intrigued by it just because I’m the type of person who likes to have her hands in a bunch of different pots. So I decided to go into convergence journalism and my emphasis was multi- media producing. Q. After college, and getting a taste of the future many realize the job they desired is not the right fit. What made you decide to stick with journalism and producing? I produced for magazines, [an] online newspaper, and producing for the convergence website. I also did producing for KOMU, which is the NBC affiliate in Columbia, MO. When it came time to apply for jobs, I decided that I was still very much passionate about being a producer for television. I still also wanted a job that would let me still have a hand in online since I spent the majority of my college career doing online things. Q. What was the process like applying for your first job after graduation? I kind of wanted to be somewhat closer and if not closer, make enough money where I could fly home if I wanted to. I applied to different jobs and eventually I heard back from KAIT in Jonesboro, Arkansas, which is a 181 market. I was a little hesitant about going there just because I knew I wasn’t going to make a lot of money and that’s one of the things that they told us at Mizzou, “You’re not going to start off making a lot of money.” So my parents encouraged me and said, “Try to look at this as a graduate internship or something like that,” so I did. Q. Once you joined the KIAT team, as your first professional job, how did that experience impact you? I got to Jonesboro and I met probably one of the scariest people that I have met in my career and her name was, Patrica Davis. This woman has been producing off and on for about 17 years, and used to be an English teacher. I was taking over her position while she moved up to another position at the station, the 6pm and 10pm shows were basically her babies. When I got there she was very, very tough on me. I begin to question if this is the career for me? If I really wanted to pursue journalism? [I] talked to my mom about it and she said, “You know some people just have different ways of teaching.” Looking back on it, I appreciate how tough Patricia was on me. She wanted me to take my job seriously just as she did. Davis saw that I had the potential to be a great producer so she was pushing me to limits that I wasn’t used to being pushed to. So now its given me a great appreciation for what I do as a profession and also has helped me have the desire to help others who want to purse this career also. Q. Were there any preconceived hardships you felt you would face being a black producer? If so, how are you helping yourself to dispel those. I wouldn’t say it’s a preconceived notion, but its kind of a reality when you kind of are stuck between a rock and a hard place when there are hot- button issues. Especially when they are dealing with race particularly if it’s dealing with somebody of color be it black, Hispanic, Asian, particularly black. Here in the past few months we had a major cop racial issue and to this day I still don’t know exactly all the back story on it, but this young man who was African American, died while in police custody. The police said that he committed suicide while handcuffed in the back of the police car and there are other people that said it wasn’t possible for him to do that and the cops shot him. I’ve never made a judgement one way or another, because being in this industry I really do feel like I have to watch [myself] I can’t make decisions anymore based off my emotions anymore. In this industry, I really do have to base off of facts. One of the things that I tried to do [was] talking to people on both sides: the cop and those who believe he didn’t commit suicide. I felt like it was for me to say that we are in an era where there are cops who still hold prejudices against a young black man. It still happens everyday in this country where there are black males who are pulled over just because they look suspicious not because they fit any kind of description because they have committed a crime they just look suspicious and so they are pulled over by cops. Then on the other side, I have to say just because there has been a history of cop brutality you can’t jump to a conclusion every time there is a white cop and a black cop involved. So not playing the peacemaker, I don’t feel like that’s my job necessarily. But exposing both sides has been my duty especially in that issue I want people to be educated on both sides and both perspectives because I can understand both perspectives. It goes back to W.E.B. DuBois theory of the “double conscious mind’ and I feel like as an African American women I have a triple conscious mind because I understand what its like to be American, to be black, and also to be a woman. So I can see all three perspectives and I feel like its my duty and I can’t just sit back and not say anything. I educate all people on all sides on all perspectives. Q. 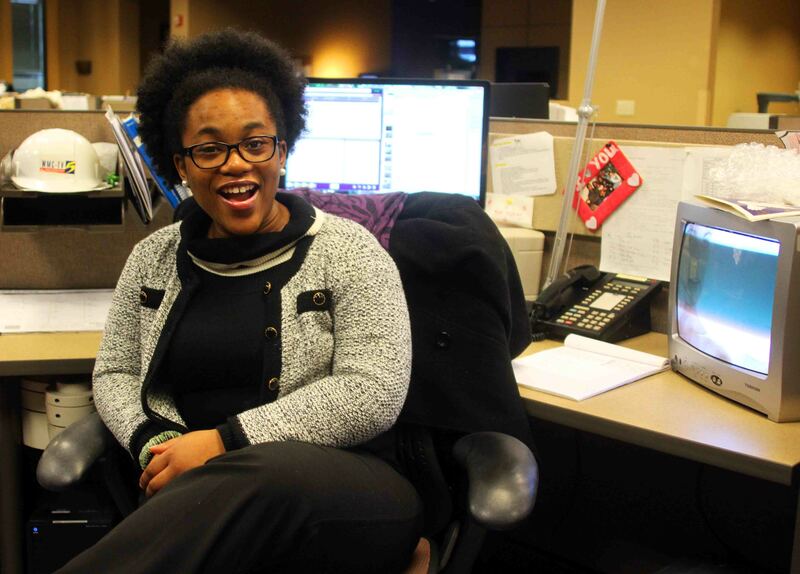 After transitioning from KAIT what were you looking for in a newsroom before you joined the team at WMC-TV ? I want to work with open minded people. It doesn’t have to be a certain quota of white people, black people or certain quota of Asian people because you can have all different races and gender, but if everyone is closed-minded you aren’t serving a purpose. So my biggest thing moving on to a different newsroom was very open- minded people who are open to seeing different perspectives and telling different stories not always we are quick to show. But I also feel at the same time I want to work with a group of people who are about teamwork and bettering the community as a whole not just one section of the community but all the community. I feel like so many times we get caught up and I don’t want to say minorities, but we need to make sure our people are shown in a positive light. We need to make sure there are positive stories shown as well. It is our duty as journalist to make sure the stories are told so if there’s gang violence and the majority of those people are black then obviously there’s a story that needs to be told. But we also need to follow up and see if there is anyone trying to make a difference. I believe that we have to tell the bad news along with the good news. Open- minded people and people who are passionate about what they do. If you’re passionate about what you want to do then you’re going to want to give your best and want to tell the story the best way that you can. If you’re going to be lazy and find the easiest way out you’re just gonna tell the story the way it comes to you. You’re not gonna dig deep and try to get to the root of the story. Q.What words of advice do you have to those who are considering pursuing journalism? Always be true to who you are. It doesn’t matter if you’re the only black person or black female [which] was the case when I got to my current station. I was the only African American woman in a powerful position and I still had to be true to who I was if I felt like something wasn’t right or if something wasn’t being told right I had to let my position be known. I’m going to look at my emotions and not let that get in the way of what I have to say. Be true to who you are and don’t let anyone change who you are. To find out more about Thomas and examples of her work visit here. Oh My Dearest Britt, I’m ever so proud of you. You have worked so hard and inspired so many on your journey including me your Mom. Your obedience to God first and your parents, as well as you being able to learn and gleam from others who have so much to offer is astounding. This website not only shows your evolving professionalism, knowledge and skill but your God Given Gift in the field of Journalism. I pray for God’s continued blessings in your life and may you walk in his plan for you with love, peace, health and much deserved success. God knows your hearts desire, keep focused don’t stop , God will use a willing vessel. Always be ready and let his works shine through you. You our little blessing from our God! This is absolutely amazing! Very proud of you! Congratulations on your launch! Awesome job Brittany! God is doing a mighty work in and through you! I’m all smiles right now :-)! Congratulations Brittany! I love it, and so proud of you for creating your own opportunities! I really enjoyed reading the interviews in this story. Your skillfulness and mastery of journalism is proudly exhibited. You’re an accomplished journalist and I was enthralled with how you were able to cut to the chase and ask those questions that would truly reveal the personality of those women you interviewed. You “let your light shine” and God’s anointing coupled with the Godly principles that were instilled in you by Godly parents are truly evident in your professionalism. “Excellent journalism” spoken from a former journalism and creative writing major. ..Continue walking in your destiny.